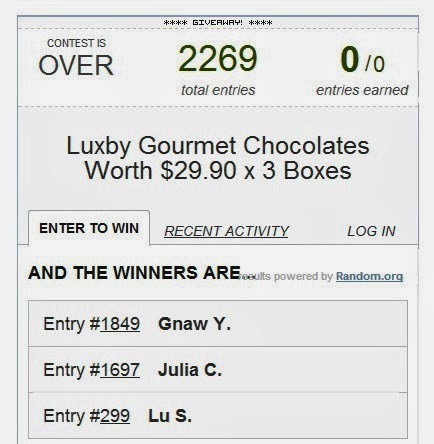 Winners Of Luxby Gourmet Chocolates Giveaway! You are here:Home » Luxury Indulgence » Winners Of Luxby Gourmet Chocolates Giveaway! 3 winners are on their way to taste some really awesome gourmet #chocolates! 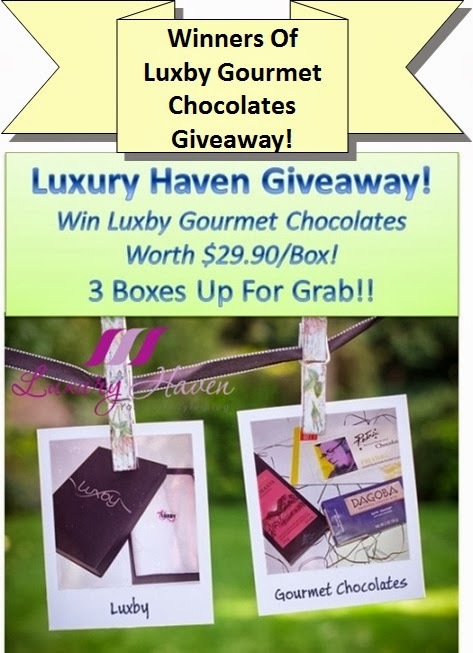 Thanks again for all your entries at Luxury Haven’s Luxby Gourmet Chocolates Giveaway! These 3 lucky readers will each have a box of #Luxby Premium Chocolates worth SGD 29.90 delivered to their doorstep! Email me @ luxuryhaven [at] hotmail [dot] com with your delivery address for Luxby to send you the chocolates. Thanks again Luxby, for this delicious Giveaway! Congrats to the winners and I am sure they will have a wonderful time eating the gourmet chocs. Congrats to the winners! Enjoy your chocolate delivery. Thanks Shirley and Luxby! I've sent an email to the address. Thanks for the prize. Hope this time I can post sucessfully. Congratulation to the winners. :)) Shirley, keep up the good job, hope I got chance to win again in your future giveaway.